Home Knife News Wire Forged Knives Fever! Forged knives are the focus of the latest BLADE®, on newsstands now! The Ikoma Korth Bearing System developed by Flavio Ikoma and Ricardo and Paulo Lala—here on a Korth Carved Reptile—helped revolutionize flipper folders. J.T. Oldham shares his views on whether you should reboot your knife collection in this issue. Find out where art knives such as this model by Dennis Friedly are headed in this issue of BLADE®. Hot knives don’t get any hotter than those hammered to shape in the forge, and the latest BLADE® focuses on forged knives in all their radiant glory. Chris Amos provides tips for novices on how to forge knives in this issue of BLADE®. 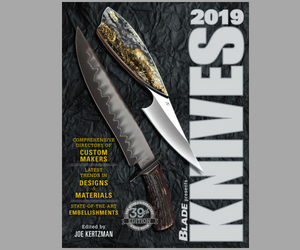 There’s much more in this issue, including how the flipper folder changed knife history, tests of two hunting knives, sharp holiday season gift ideas and much more in the latest edition of BLADE, on newsstands now or available in the digital edition. Or, you can subscribe to the domestic print, digital, Canadian print or international print editions.